Built in 2006, the J. C. Williams Community Center is a 501 ( c ) (3) federal tax exempt charitable organization that was designed, developed to create programs and services that promote arts and education the environment, disabled, veterans, youth empowerment and recreation, fight hunger and confront issues relating to our community. If there is to be change in our communities, it must come about through community-based outreach and the efforts of individuals who have a personal long-term commitment to community and social services. The J. C. Community Center is committed to exhibit such commitment. Thus, we make this appeal to corporations, foundations, businesses and private donors who share our concern for the preservation of our community to consider assisting us with your financial support. We appreciate your contribution. Thank you! James Cal Williams was born January 5, 1934 to Cal and Annie Mae Williams. Growing up on Carter’s plantation, young James was a risk taker, a planner, a dreamer, and a visionary. In 1951, while on vacation from school, James Cal came to Springfield, Massachusetts. During that vacation he gave his life to Christ at the Holy Temple Church of God in Christ which was under the leadership of the late Bishop I. L. Jefferson. James Cal married the love of his life, the former Dorothy Mae Brown In 1954. From that union came five children… James Williams Jr., Joyce Ann, David Earl, Steven Renard, and Julia Annette. In 1956 He was ordained Pastor by the late Bishop H. P. Richardson, Bishop of the state of Massachusetts for the Churches of God in Christ. In 1958, James Cal Williams answered the call as an international evangelist. He made Albany, New York his home headquarters, Saint John C.O.G.I.C his home church, and Pastor John Johnson, his home pastor. He pastored his first church in 1960 in the city of Pittsfield, Massachusetts, and his second in the city of Albany, New York. In 1965, the late Apostle Arturo Skinner, ordained James C. Williams in the Deliverance Ministries. In 1967, Springfield, Massachusetts became home of the third church that James Williams pastored and opened a fourth church opened in Hartford, Connecticut one year later. 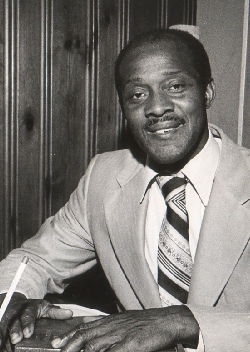 In 1991, Pastor J. C. Williams opened and began pastoring his fifth church in Bloomfield, Connecticut. Some of his accomplishments were bringing R. W. Schambach to the John Hancock Building in the city of Boston, and to the Springfield Area. He was also the first to hold tent meetings anywhere in this area of Massachusetts, establishing a 24-hour prayer line, The Revival Time Bible Institute, The J. C. Williams Scholarship Fund, The Revival Time Radio Hour, The We Care Ministry, The Big Brothers Club, an International Convention, and a Soup Kitchen. Pastor J. C. Williams laid the foundation for the New Millennium Building which is now known as the J.C. Williams Community Center in his honor. On January 5th 2004, Apostle J. C. Williams went home to his eternal rest.